Antron Brown, a five-time Route 66 Raceway winner lined up opposite of his Army Racing teammate Leah Pritchett in round one. Brown had the starting line advantage but was up in smoke early into the run. Brown pedaled it in an attempt to recover but was unable to catch up with Pritchett, who made a clean, straight pass down the track and across the stripe. "This wasn’t the way we wanted to end our weekend here in Chicago, but my Matco Tools/U.S Army/Toyota team made some good progress in qualifying. It’s not showing on race day, but it will very, very soon. We were very close to making the clean pass that we needed today and it's clear that we are making the strides that we need to make. Out of the last nine runs, we’ve gotten down the track seven times. So, we’ve got to continue taking the positives and keep working hard to move forward. We are looking forward to getting to Virginia and getting back after it." E1: 3.769 E.T. at 329.67 MPH defeated Antron Brown 5.402 E.T. at 134.91 MPH E.T. 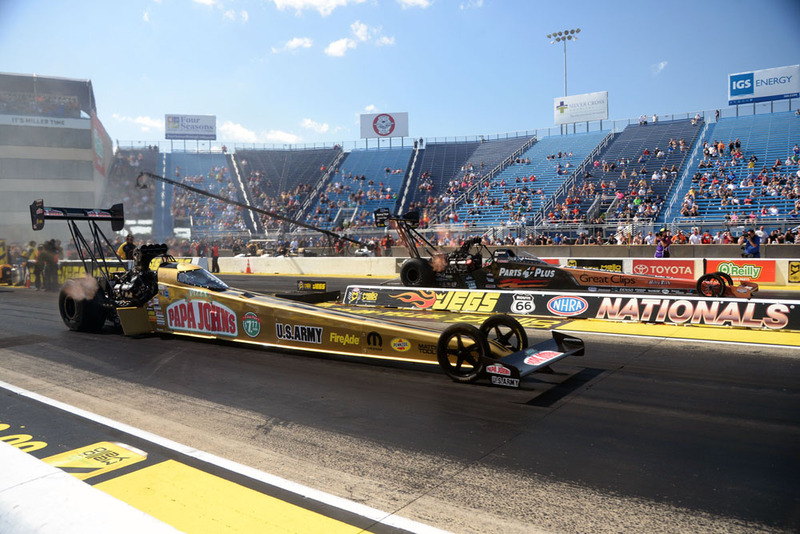 Leah Pritchett raced to her fourth career runner-up finish on Sunday afternoon in Joliet. 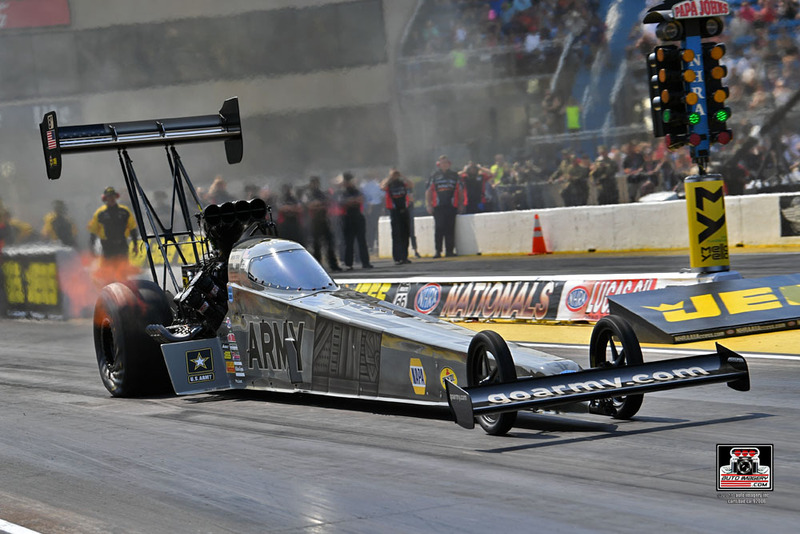 The final-round appearance was the second of the year for Pritchett in her Papa John’s Pizza Top Fuel dragster, including a victory at the NHRA Atlanta event in May. Starting tenth and from the bottom half of the field for just the second time this year, Pritchett opened Sunday in strong fashion by defeating higher-qualified teammate Antron Brown with her quickest pass of race weekend, a 3.769-second E.T. at 329.67 mph. The Mopar-powered Top Fuel pilot next took out Kyle Wurtzel, leading from start to finish on a 3.929-sec pass that was quickest of the quarterfinals. In a rematch of the Atlanta final round, Pritchett faced Blake Alexander in the semifinals. The Papa John's dragster pilot trailed her opponent just slightly at the start, but quickly zoomed ahead with a 3.832-sec run, once again outrunning Alexander, and advancing her to her first-ever final at Route 66 Raceway. After qualifying inside of the ‘top three,’ Tony Schumacher faced Billy Torrence in round one. 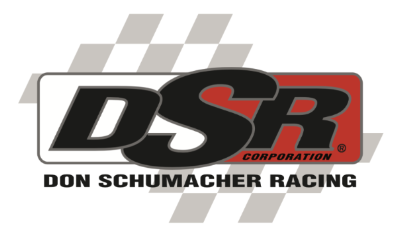 Schumacher was seeking his sixth Route 66 NHRA Nationals victory at his hometown track, but unfortunately for ‘The Sarge,’ the Army Racing machine smoked the tires at halftrack, enabling Torrence to take the win with a clean 3.784-second pass. Mopar-powered Infinite Hero Foundation driver Jack Beckman started race day from the top half of the field and with the advantage of lane choice versus his first-round competitor, Dale Creasy Jr. Beckman held a 4-0 lead over Creasy in previous matchups and was able to extend his undefeated record on Sunday. During their round one meeting, Beckman was out of the gate first and had the immediate lead over Creasy whose parachutes deployed early into the run, allowing Beckman to drive away with the round win. The quarterfinals found the 2016 Route 66 NHRA Nationals Funny Car champion lined up opposite of John Force. Beckman once again had the starting line advantage and held the lead early into the run before losing traction near the 330-foot mark. He finessed the throttle, but Force, who dropped a cylinder later in the run, was able to pull away for the win. Ron Capps raced to a runner-up finish at the JEGS Route 66 NHRA Nationals on Sunday afternoon. The driver of the Mopar-powered NAPA AUTO PARTS Dodge Charger R/T entered the weekend as the defending event champion and came up just short of picking up his third Route 66 Raceway Wally. Capps’ campaign for the Joliet trophy began with a round one matchup versus Justin Schriefer. 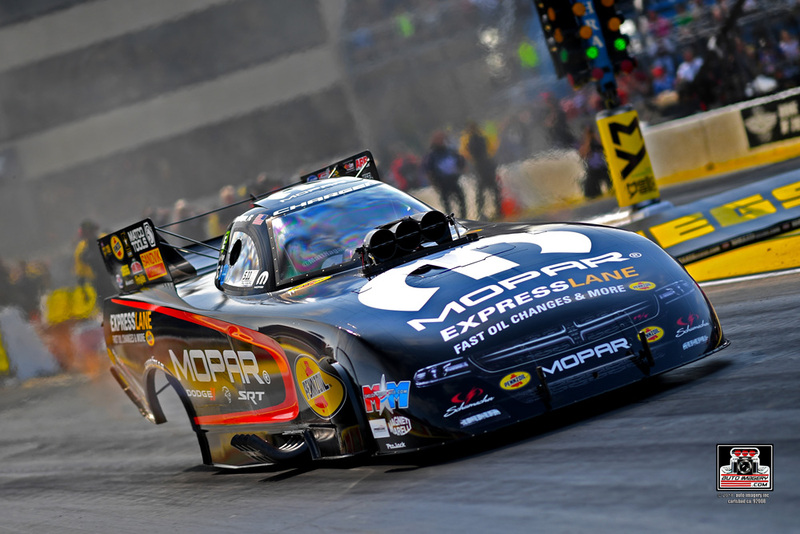 An impressive qualifying performance allowed Capps and his team to start race day from the No. 2 spot and with the advantage of lane choice versus their first challenger. Schriefer lost traction early into the run enabling Capps to drive around his competition and onto victory. In the quarterfinals, Capps faced Shawn Langdon and was quick on the throttle, leaving the line first and never trailing for the win. A 4.104 E.T. provided him with lane choice over his semifinal opponent, John Force. 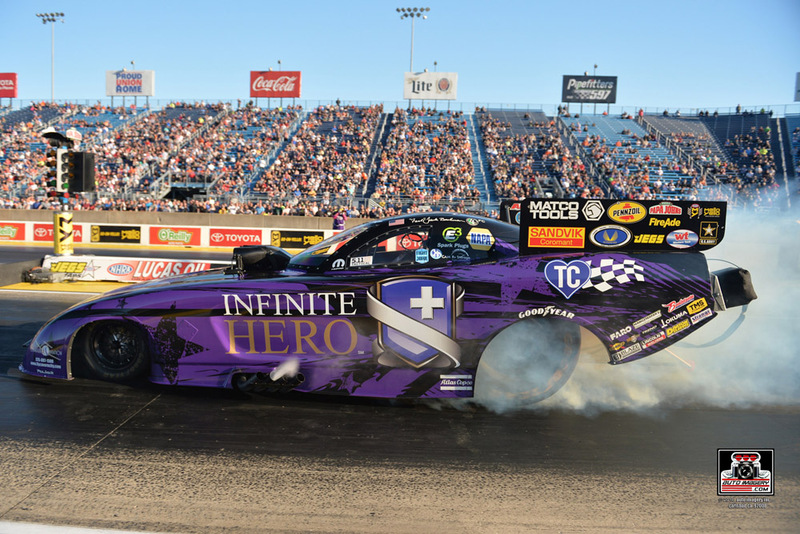 In the 93rd meeting between the veteran drivers, the second most head-to-head matchups of any two drivers in the pro classes, Capps once again had the advantage at the tree. He powered the NAPA Dodge to his best pass of the day, activating the win light with a 4.058 E.T. Next up for the 2016 Funny Car world champion was a final round battle with the reigning world champ, Robert Hight. 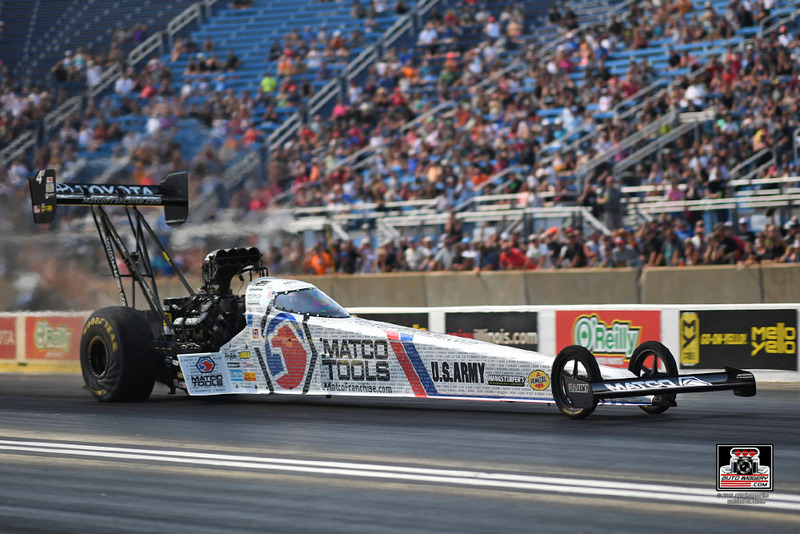 It was Capps’ third consecutive Joliet final round appearance and first of 2018. Hight pulled away first and was able to seize the victory over Capps’ tire-smoking effort. 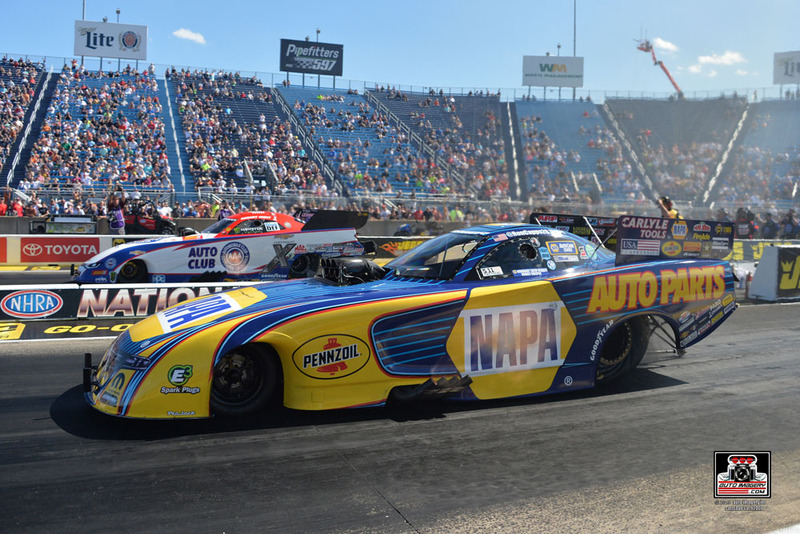 A solid Route 66 Raceway showing enabled Capps and the Rahn Tobler-led NAPA AUTO PARTS Funny Car team to bank nearly 100 points over the course of the weekend, and bumped Capps up from seventh to sixth in the NHRA Mello Yello Funny Car points ranking. “It’s so nice to have our NAPA car back to where it was when we won the championship in 2016, and our eight wins last year. I always brag about the NAPA Know How that Rahn Tobler has, and this weekend, I could tell we’re back to where the car is doing exactly what he wants it to. For me, that means it’s going to be a lot of fun because we’re going to win a lot of rounds this summer. We’re going to fight to get back up and get the point lead going into Indy. We’re back a little ways, but we’re making up ground. Great weekend for the NAPA AutoCare guys." Matt Hagan spearheaded the dominant DSR 1-2-3 qualifying performance at Joliet, racing his Mopar Express Lane Dodge Charger R/T Funny Car to the No. 1 spot. The two-time Funny Car World champ had the early advantage over Jonnie Lindberg in round one and never looked back with a winning 4.017-second at 320.74-mph run that earned him lane choice over Bob Tasca III in the quarterfinals. Hagan, a three-time winner at Route 66 Raceway, and Tasca both left the starting with identical .074 marks. The two were locked together neck-and-neck for much of the race, but Tasca began to slowly edge ahead and was able to outrun Hagan’s 4.149-sec pass. 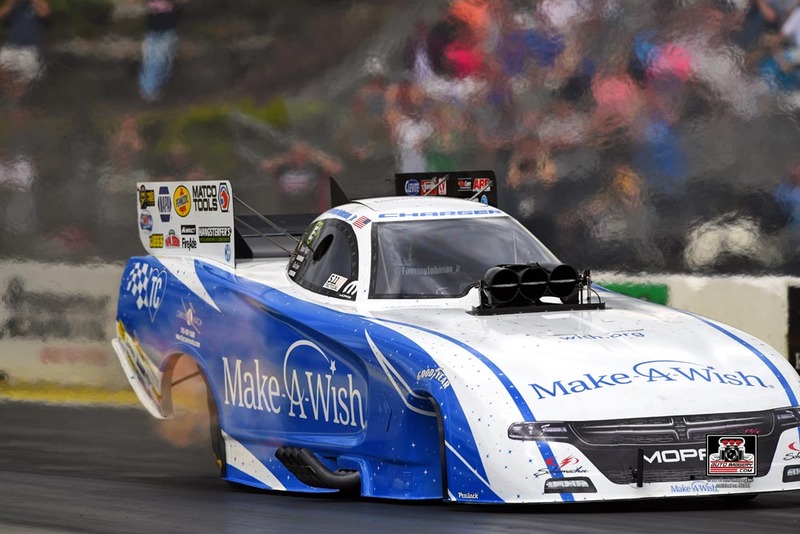 Steady improvement during qualifying provided Make-A-Wish Dodge Charger R/T Funny Car driver Tommy Johnson Jr. with encouragement heading into a first-round eliminations fight with Shawn Langdon. Gunning for his second career win at Joliet, Johnson left first with a .076 reaction time to Langdon’s slower .097. That promising start ended with a boom under the hood near the 300-foot mark that cracked Johnson’s Funny Car body nearly in half, with the vehicle slowing to a stop and Johnson emerging quickly and safely. "A little frustrating, the track surface was giving everyone fits first round. The cars won’t stay hooked up. We went out there and it spun the tires. I couldn’t see Shawn (Langdon) at that point, but it’s race day so you try and get back in it and do everything you can to get it down to the finish line. I just touched the throttle and it blew up. It’s unfortunate, but we’ll regroup and go on to the next one."